Arcana is a two-player card game that makes use of the 22 cards of the “major arcana” (better known as tarot cards or trump cards) of the 78-card tarot deck. The game has no connection to tarot cards or fortune telling beyond that; it was actually inspired by the video game, The Binding of Isaac, which involves all of the 22 cards and assigns different effects to each card (e.g. extra life, teleportation, invincibility, etc.) that assist you in the game. 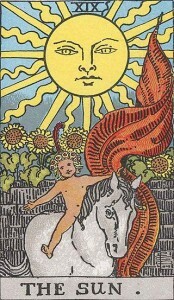 Both players begin with their own respective and complete 22 card deck of the major arcana. The game is played in rounds, each player throwing one card per round. A coin flip decides whether the game begins on either Round 0 or Round 1. This matters because whether any given round is even (Round 0) or odd (Round 1) is significant in determining the outcome of each round. There are essentially five components of Arcana: HP, damage points, key points, time (hours), and card removal. HP represents the player’s health points. Each player begins with 6 HP. If your level of HP reaches 0, then you lose the game (the other player wins). There is no limit to the amount of HP that a player can have. Damage points can be spent as an attack on your opponent’s level of HP. Each player begins with 0 damage points. You must spend 5 damage points in order to take away 1 HP from your opponent. A player cannot have negative damage points. Key points are spent in order to unlock chambers. There are 9 chambers to be unlocked. Each individual chamber takes 9 key points to unlock and grants either HP, damage points, or time. Once the 9th chamber is unlocked, the player who unlocked it wins the game. Each player begins with 0 key points. Time is a factor which is kept in whole hours. Each player begins at 9 AM. If a player reaches midnight (12 AM) before the other does, then that player loses the game (the other player wins). Both players lose 1 hour at the beginning of each round that is a multiple of 12 (12, 24, 36,…). 1 AM is the earliest time that a player may go back to. Removal of cards is also a factor of the game. If all of a player’s cards have been removed from play, then that player loses the game (the other player wins). As you can see, this means there are effectively four main points of strategy: depleting your opponent’s HP with damage points, unlocking chambers with key points, moving time forward for your opponent, or removing your opponent’s cards from play. The Magician – Card Removal – Odd – This card is particularly useful, as it is the only card whose specialty is removal. However, beware that is easier to lose this card, as The High Priestess, Justice, The Devil, and The World cards may also remove The Magician card from play. The High Priestess – Balanced Mix of Effects – Odd – Either 1 HP, 3 damage points, 3 key points, or 1 hour may be gained. The Empress – Key Points – Odd – 3 key points may be gained. The Emperor – Damage Points – Odd – 3 damage points may be gained. The Hierophant – HP – 1 HP may be gained. The Lovers – HP – Odd – 1 HP may be gained. The Chariot – Damage Points – Odd – 3 damage points may be gained. Justice – Balanced Mix of Effects (Removes points and hours from opponent) – Either 3 damage points, 3 key points, or 1 hour may be taken away from your opponent. The Hermit – Key Points – 3 key points may be gained. Rolls a 1 – Gain 3 damage points. 2 – Gain 3 key points. 3 – Gain 1 hour. 4 – Opponent loses 3 damage points. 5 – Opponent loses 3 key points. 6 – Opponent loses 1 hour. Strength – Damage Points – 3 damage points may be gained. The Hanged Man – Key Points – 3 key points may be gained. Death – Damage Points – 3 damage points may be gained. Temperance – HP – 1 HP may be gained. The Devil – Balanced Mix of Effects – Odd – Either 3 damage points, 3 key points, or 1 hour may be gained; removes The Magician card from play in an even round match-up. The Tower – Defensive Effects – Either 1 damage point or 1 key point may be gained. Your opponent may also either gain 1 damage point or 1 key point. When played against itself, both player’s Tower cards are removed from play. When played against The Fool, the cards switch places. The Star – Time (Both gains hours and removes hours from opponent) – Either 1 hour may be gained or your opponent may lose 1 hour. The Moon – Time (Removes hours from opponent) – Odd – Your opponent may lose 1 hour. The Sun – Time – 1 hour may be gained. Judgment – HP/Damage Points – Odd – Either 1 HP or 3 damage points may be gained. The World – Balanced Mix of Effects – Either 1 HP, 3 damage points, 3 key points, or 1 hour may be gained; removes The Magician card from play in an odd round match-up. The Fool – Defensive Effects – Either 1 damage point or 1 key point may be gained. Your opponent may also either gain 1 damage point or 1 key point. When played against itself, both player’s Fool cards are removed from play. When played against The Tower, the cards switch places. These spreadsheet files contain all of the effects for each possible match-up. For instance, if one player throws The Star card and the other throws The Hanged Man during an even-numbered round, we can see from the spreadsheet that The Hanged Man’s player loses 1 hour. Once the cards have been thrown, it is only a matter of either looking up the correct reference number in the “Chart” tab and then locating the corresponding number in the “Reference” tab…or by looking up that particular match-up on one of the individual card’s tabs. Even round outcomes are on the left-hand side while odd round outcomes are on the right. For any further clarifications, questions, or comments, don’t hesitate to send me an email – Jordan@yaddlezap.com Enjoy playing!